'Digital Detox' Vacations Mean Totally Unplugging From Technology, Including Smartphones And Cameras : 13.7: Cosmos And Culture Do we really need to unplug to ensure the most satisfying vacations? Anthropologist Barbara J. King returns from Yellowstone National Park with a qualified "no." 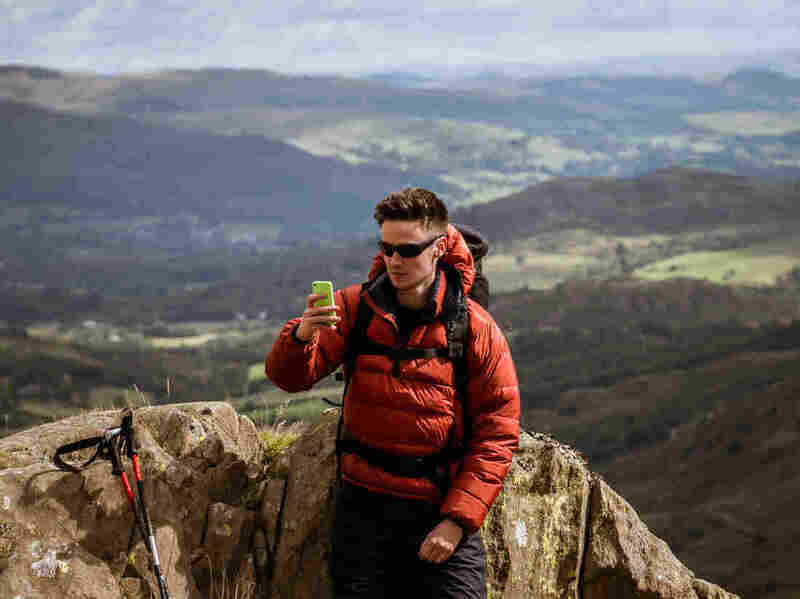 Last week, The New York Times described "a new category of Digital Detox trips in which participants pledge, in writing, to swear off all digital devices including cellphones and cameras" for 8 to 10 days of travel. If you sign up, you get a notebook to record memories. Travel leaders will even send email updates to your family, if you'd like. Sounds virtuous, doesn't it? Shouldn't we all be disconnecting more, especially on vacation? Well, I'm just back from vacation. Last Friday, my husband and I checked into Canyon Lodge in Yellowstone National Park. On our way to the lodge from Jackson Hole, Wy., coming in through Grand Teton National Park, we had already been thrilled to see a moose family along a riverbed and, in a lush valley, dozens of the iconic bison whose presence lures us back time and again. But standing there at the registration desk, my nature reverie was broken by the people checking in next to us. One woman was asking in a disappointed tone if there was really no Internet access in her room — and could really only one device be used if she paid for access in the single area (in a sprawling complex) where it's available? Here we were in the midst of one the greatest ecosystems in the world, featuring abundant mammal and bird species, not to mention magnificent geothermal features, and folks were worrying about getting online! Except, here's the truth of it: My attention was caught by the woman's words not because I thought to sneer at them, but because I was thinking pretty close to the same thing. "For a decade and a half, I'd been a web obsessive, publishing blog posts multiple times a day, seven days a week, and ultimately corralling a team that curated the web every 20 minutes during peak hours." "I tried reading books, but that skill now began to elude me. After a couple of pages, my fingers twitched for a keyboard. I tried meditation, but my mind bucked and bridled as I tried to still it. I got a steady workout routine, and it gave me the only relief I could measure for an hour or so a day." "The smartphone then went and made the rabbit hole portable, inviting us to get lost in it anywhere, at any time, whatever else we might be doing. Information soon penetrated every waking moment of our lives." And that brings us back to Yellowstone — where information was most definitely not penetrating via our little phones or our other devices. Now I'm riffing a little bit here, because I didn't find it so hard to let go of constant Internet connectivity. After all, I'm an animal person and I find joy in nature. The next day, driving out from the lodge and taking short walks, we saw not only bison up-close (because they surrounded our vehicle; we didn't approach them), but also elk, pronghorn and trumpeter swans. At odd times, both our cellphones would spring to life with bings, buzzes or beeps, when we'd apparently stumbled into a rare area of coverage — and we ignored them. We were in Yellowstone to hear the elk bugling and mud volcanoes growling, not technology. Via some fine sleuthing, my husband discovered that if we went from our first floor room up to the third-floor lounge, we had pretty decent, if variable, access via our carrier. And there, for a while each morning and night, we sat, getting our fix. By contrast, I couldn't do without my cellphone camera at all. Amateur wildlife photography for me adds genuine enjoyment to our travels. So, if I can find a camera-friendly "unplugged trip" into a national park, will I try it out? Maybe. But only if the detox was limited to bankers' hours.